1. Adopt PLC control and color touch screen. The screen adopts icon and word explanation for easy operation. 2. It can save the setting for different products and convenient to change specifications. 3. Use two AC servo motors to control initial winding and outer sealing separately. 4. Use cylinder to extract mandrels. 5. Equipped with 4 sets of film reel pressure roller device. 6. With pre-press device. (pre-press angle can be adjusted). 7. 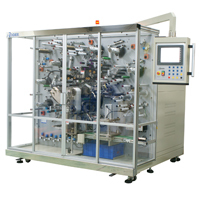 Winding tension regulation: DC servo auto regulation. 8. Film width 50 ~ 160 mm, mandrel size 30~125mm, element diameter 50 ~ 165 mm. See attached for detailed specifications.